Of the seven water privileges (potential mill sites) on the Brown's River in Jericho, number 2 is one of the best, and has a long and varied history. The early records are sketchy, but it appears that the site was owned by Truman Barney from about 1804, and sometime before 1820, he had build a grist mill here. In 1821, John Bliss bought a half interest in the mill, and ran it for several years. By the 1840's, Matthew Barney was operating a starch mill on the site, selling it in 1845 to Jacob Maeck for $4000. By the early 1850's, Anson Field, Sr. built a starch factory and a cabinet shop, in which he carried on an extensive furniture business. In 1857, James Hutchinson built a stone grist mill on the site, reportedly with money he had made selling cattle and mules to the prospectors during the California gold rush. By the early 1860's, the mill was owned by Clark Wilbur and Hira Percival. In 1866, they sold the mill to Ferdinand Beach and Lucian Howe, and Clark Wilbur moved to Minneapolis, where he worked in the Washburn and Crosby mills there. He was one of the men killed when the "A" mill exploded on May 2, 1878, and is memorialized on a plaque in the wall of the new mill built on the site. In 1871 L.B. Howe took over sole possession, and ran it as the Jericho Feed Mill. He was instrumental in bringing the Burlington and Lamoille Railroad through Jericho in 1877, and thereafter brought in large quantities of mid-western grain to be ground at his mill. In the early 1880's, his son Frank went into partnership with him, and they decided to expand the mill to accommodate their growing business. In June of 1885 the mill was shut down, and the front of the stone building was extended and the upper floors expanded to accommodate new machinery - replacing the old millstones were roller mills and purifiers, one of the first mills in New England to use this modern process. Much of this new machinery was supplied by the Case Manufacturing Co. of Columbus, Ohio, and it is believed that this photo was taken for the Case company, probably for advertizing purposes. To power this new machinery, Mr. A.C. Chick from Melrose Highlands, Mass. was hired to blast out the river channel, starting at Curtis's mill pond below the bridge and continuing upstream through the wheelhouse, using a new invention, dynamite. This about doubled the "head" of water available, and thus greatly increased the power to run the mill. 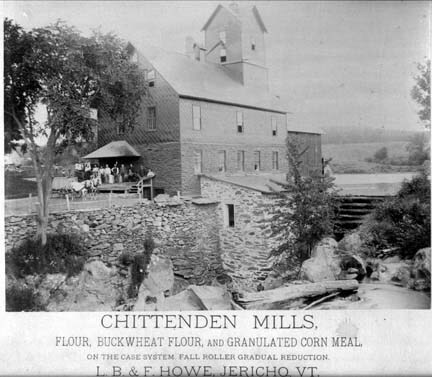 After 7 months, the new mill was back in operation, christened Chittenden Mills, in honor of Thomas Chittenden, first governor of Vermont, and great great grandfather of Frank Howe. The mill supplied flour to a large area of northern Vermont, and continued in operation until 1904, when, after the death of the head miller, George Clerkin, flour making ceased and the machinery was sold. The mill continued as a feed mill under several owners, most notably Charles Reavy and later C.S. Brush & Son. It finally closed in 1946. At that time, the Chittenden Mills garage (now the beverage center) was built by George and Floyd White, and part of the mill was used for automobile repairs. In 1954, the property was sold to Alonzo "Skip" Bennett, who ran the business with Harold Rose. The mill was purchased by the town of Jericho in 1973, and turned over to the Jericho Historical Society to maintain and restore as an historic site and community resource. The historical society has since been able to purchase the miller's house, built in 1859, and the complex has been designated a National Historic Site. Construction on the line began in Jericho on May 24, 1875, and grading and trestle work continued through 1876.